Labor Day is over and everyone has gone back to school, including the dogs! Today’s funny dog videos are all about dogs going back to school (I hope their moms packed JNC treats in their lunch boxes!). Stay tuned, at the bottom of the post, for the winner of the yummy Jones Natural Chews venison treats, as well as a special personal announcement! Our first video is actually dogs that don’t want their kids to go back to school. But I was really looking forward to a dog going back to school … and look what I found! Any of you ever watch Dog With a Blog on Disney? So that was cheesy. But what a gorgeous dog! The next video is brief. Pay attention! This dog is smart and obviously went to school to learn this trick. I sure wish Flash and Patches knew how to whisper. The next dog is a German Shepherd in training. It’s gone back to school to learn to be a police dog. This kind of training is fascinating. Last, because physical health is so important for everyone, including our dogs, this dog has gone back to school and is taking PE. Slim Doggy will be proud. Thanks for joining me today! Now let’s see who won the Jones Natural Chews Venison Entree Sausages! JoAn Stancer at Sand Spring Chesapeakes! If you haven’t visited her blog, you HAVE to check her out! Scroll back through older posts to see the most adorable Chesapeake Bay Retriever pups ever. Congratulations, JoAnn! Now, for my personal announcement. By this time next week, I’ll have two cats! We miss having a cat in the house, and the mouse situation is still out of control. 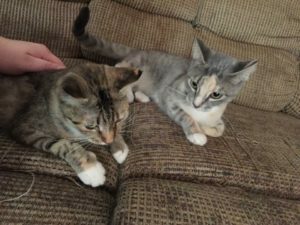 So I’ve managed, with some help, to find two young mother cats, previously feral and hunters, who’ve been gentled and will be spayed this week. They’re coming to my house next week. I’ve already named them. Ready? Here are their names. Left to right, they’re Beyonce’ and Velveeta. Lovely little cats. Whadda ya think? I think I’m going to have fun typing that every time I blog about them. Because you know they’re going to be guinea pigs for the treats, to see which of the Jones Natural Chews they’ll eat. If they like them, expect to see cats here. Beyonce’ and Velveeta. It makes me smile seeing the names in print. Ish.